When you expose the silicon die of a transistor to a light source a charge is produced. CircuitsDIY opened up a 2N3055 transistor and did some experimenting. With the help of a magnifying glass he was able to built up a charge of 0.65V and produce 42.2mA of current. Most photovoltaic cells are made of silicon chip above which there resides a very thin layer of noble metal through which around 1% of photon particles enter the material and activates electron flow. Here I’m showing how to make one simple solar panel using transistor. The simplest way to drive stepper motor having lower current rating is using ULN2003. The ULN2003 contains seven darlington transistors. The ULN2003 can pass upto 500mA per channel and has an internal voltage drop of about 1V when on. It also contains internal clamp diodes to dissipate voltage spikes when driving inductive loads. The circuit for driving stepper motor using ULN2003 is shown below. For higher current torque motors, you can use TIP120. The advantage is that the TIP120 can pass more current along with heat sink. The disadvantages are that the more wiring is required and four TIP120 is used to control the motor. Now!!!!!!! I have finally solved the issue on the charging here is prototype 1 of the circuit. 1N4001 , Why is the diode so called? The 1Nxxxx numbering system is an American standard (now adopted globally) used to mark semiconductor devices. The “1N” means that it is a single junction semiconductor device (i.e. a diode). “4001” is a number given to the smallest diode in the 400x series (4001, 4002, and so on) – the number indicates the voltage, current and power ratings of the diode. A transistor (which has 2 junctions) would be numbered 2Nxxxx. 1-single junction semiconductor device N-Silicon device 400-its a particular series whose max allowed current is 1A. x- it denotes the voltage rating. 1-50V,2-100V,3-200V… 7-1000V. SO, it is called 1N4001. The Output being high or low depends on which input is more dominant or positive. 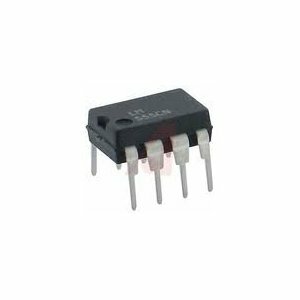 If + or non-inverting input is more positive than the – inverting input then output of LM311 is high impedance or high Z as output transistor of LM311 is turned off, but output goes high due to R2 pull-up 1K, so you can apply a load of 10K and above for source. When the – input or inverting input is more positive, output goes Low as transistor turns on, now a current of upto 50mA can sink here, a LED or Relay can be driven. The objective of the circuit is to build an electronic dice based on the functions of a 555 timer integrated circuit that operates in the astable mode. The 555 IC is a highly stable device for generating oscillation or accurate time delays used in pulse width/position modulation, sequential timing, time delay generation, linear ramp generator, precision timing, and pulse generation due to its features such as normally open and normally off output, temperature stability, output and supply TTL compatible, adjustable duty cycle, and operates in both astable and monostable mode. supplies is also possible and the low power supply current drain is independent of the magnitude of the power supply voltage. These comparators also have a unique characteristic in that the input common-mode voltage range includes ground, even though operated from a single power supply voltage. and high voltage digital logic gates. The LM393 series was designed to directly interface with TTL and CMOS. When operated from both plus and minus power supplies, the LM393 series will directly interface with MOS logic where their low power drain is a distinct advantage over standard comparators. This long winded intro brings me to the subject of this post: RS485. This is a serial communications specification that uses differential signaling. The awesome thing about this is that it offers many cool things, one of which is improved noise immunity. As the wire contains the same signal twice (once normal, once inverted) When it gets to the other end, and the inverted signal is transformed into a non-inverted signal and combined with the original signal. Any electrical noise that was picked up is then cancelled out due to wave mechanics. Cool, huh?